The WAHABI (BROTHERHOOD) are a world -wide vermin, destroying everything, even that which is holy and sacred. They have demolished mosques and shrines all over Libya. 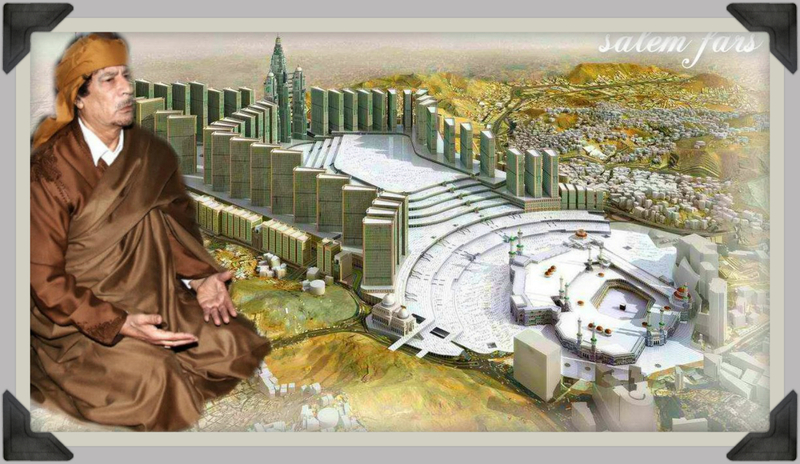 They announce to destroy the Holy Kaaba in Mecca as well. Our address all Libyans, without exception, all political orientations ..
And extremist groups and Brotherhood bankrupt .. Rotating them and Hantehroa Njusthm of the country ..
and we will celebrate “Eid Al Fateh” with pride and stepping up to Athtamoa to provoke any traitor or Fberaara. Flaém place of celebration Otrivh celebration of the most important, are the people revelers and their sense of celebration ..
O world, we exist and we will celebrate; and I will challenge everyone. 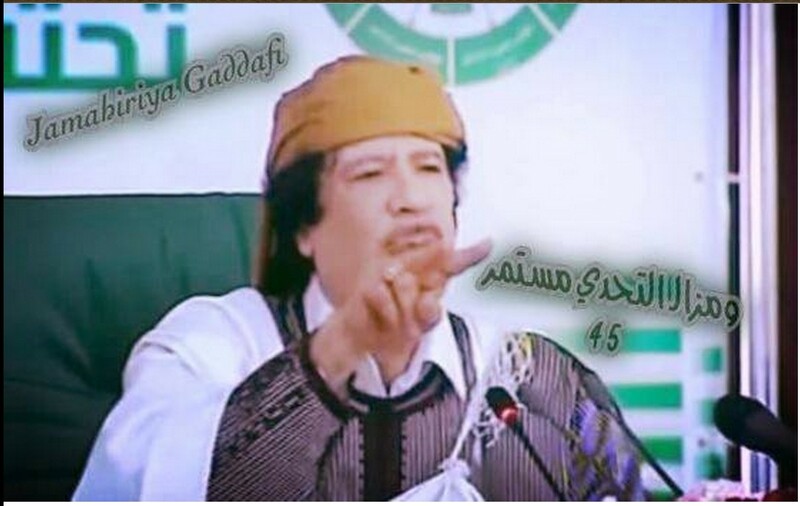 and we will celebrate Bokhalsna and steadfastness on the principle Snbehr the world our love for Muammar al-Qathafi. Be assured Sir, Commander, that your daughters and your sons Liberal, will celebrate the distant light, even in the simplest way. to prove your presence from now until the promised day Otz in Tykes and lengthwise crosswise ferry writing words sound on Paltalk pictures, leaflets singing the simplest ways, and Bosabha on the ground, on the Internet within the country, or outside, or even in the Mars. It is important, that we are on the hearts and a thorn in the Helloukkm Thbtona, and will never give up ..
Libya needs foreign help to defeat an alliance of inter-global WAHABI-Islamist militias who seized Tripoli on Sunday, announcing a breakaway regime (calling themseves the ‘salvation of Libya’ or “LIBYA DAWN”), and who are “now stronger than any one government itself”, the country’s foreign minister has told the Guardian. Mohamed Abdel Aziz stressed he was not calling for direct foreign military intervention. But he said Libya’s government, which has fled east to Tobruk, is now unable to safeguard key state institutions by itself, and called for “arms and any other equipment … that could ensure the possibility of protecting our strategic sites, our oilfields, our airports” against militias “stronger than the government itself, and who now possess arms even more sophisticated than the government”. Abdel Aziz’s call came as the new WAHABI BROTHERHOOD militia leadership in Tripoli appointed a former guerrilla commander as head of a reconvened WAHABI BROTHERHOOD Islamist-led parliament, formally breaking with the country’s elected government. Omar al-Hasi, a former commander with the Libyan Islamist Fighting Group, which fought against Muammar al-Qathafi, was announced as “prime minister” of the officially defunct general national congress by Islamist leaders meeting in a city hotel. 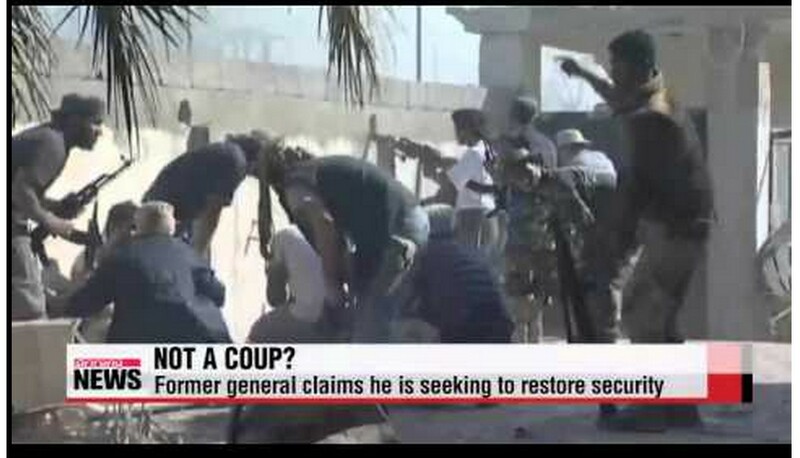 Speaking to the Guardian in Cairo, Abdel Aziz ruled out requesting foreign air strikes against the insurgents in the short term – but hinted that they might be needed if negotiations with the rebels fail. “Once we cannot achieve a serious or meaningful dialogue among all the factions, perhaps we can resort to other means afterwards,” said Abdel Aziz, who was at a conference for regional foreign ministers about the future of Libya. Journalists have also been singled out. There were attacks on the nationalist TV station, Al Asima, while the home of a correspondent for TV channel Al Arabiya was set ablaze. Villas of government officials were set alight and gunfire erupted in several districts of the city. Wahabi-Islamists have replaced the editors of the two state TV stations, with the government responding by blocking their satellite signal. 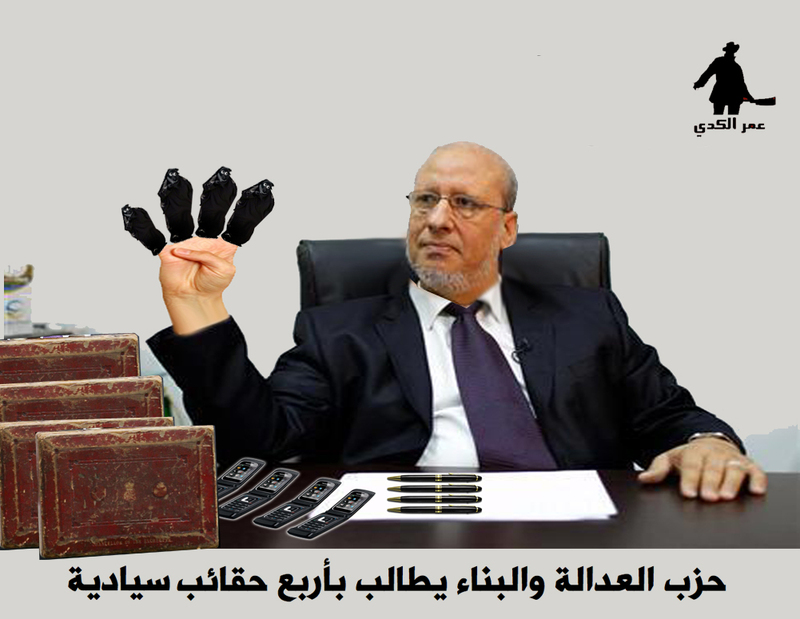 ‘Muslim’ Brotherhood and terrorist groups make OMAR HASSI their new Prime Minister of Libya ! Libya’s defunct outgoing Allaotunai Conference of the (MB) General National Congress (GNC), has appointed a new prime minister in a move set to deepen the country’s political split as warring factions vie for control of the country. The closing statement of the ministerial meeting came as the WAHABI Brotherhood Islamists, who seized Tripoli airport from the Zintan Airport Security teams on Sunday, doubled down on their opposition to the new assembly. 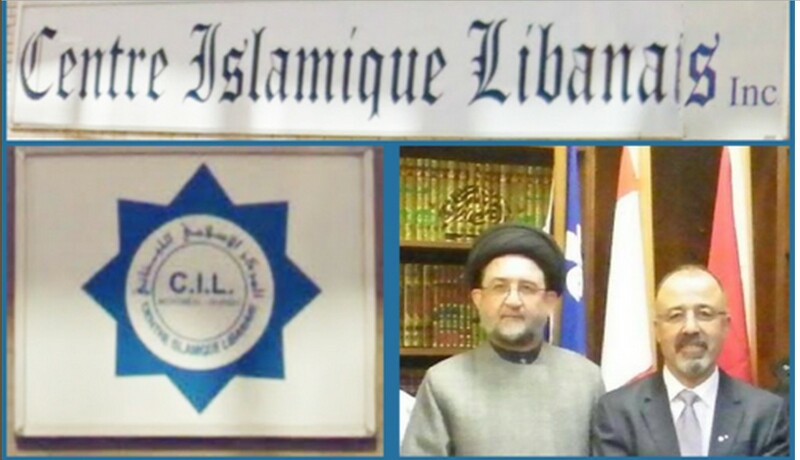 The WAHABI BROTHERHOOD Islamist-leaning former interim parliament — whose term of office expired in February — held a session in Tripoli, reportedly at the behest of the triumphant WAHABI Brotherhood Islamist militias, and elected university professor Omar al-Hassi to head a “national salvation government”. Libyan news site Ajwa.net quoted General National Congress spokesman Omar Humeidan as saying the assembly had ordered a state of emergency and general mobilization. The Criminal coalition of WAHABI Brotherhood Islamist militias and forces from the mid-western city of Misurata, known as “Libya’s Dawn”, meanwhile undertook a campaign of “arrests” (which really are illegal ABDUCTIONS) in the capital, “al-Wasat” reported quoting witnesses. LANA, quoting TV network al-Nabaa, on Wednesday said the ministers of industry (Suleiman al Taif) , labor, planning, education and water resources, and the state minister for the affairs of the wounded, have submitted their resignations along with Abdullah “bending” al-Thani. Unexpected sanctions against members of the House of Representatives absent. Qatari Foreign Minister Khalid bin Mohammed al-Attiyah, left, arrives to attend a meeting of Gulf foreign ministers in Jeddah, Saudi Arabia, Saturday 30 Aug. 2014. The meeting of Gulf foreign ministers ended on Saturday without a clear way out of a monthslong diplomatic spat with Qatar, although some envoys signaled that progress had been made. Saudi Arabia, along with the United Arab Emirates and Bahrain, withdrew their ambassadors from Qatar in March in an unprecedented public protest largely believed to be spurred by the tiny nation’s support for Islamist groups in Egypt, Libya, the Gaza Strip and elsewhere. 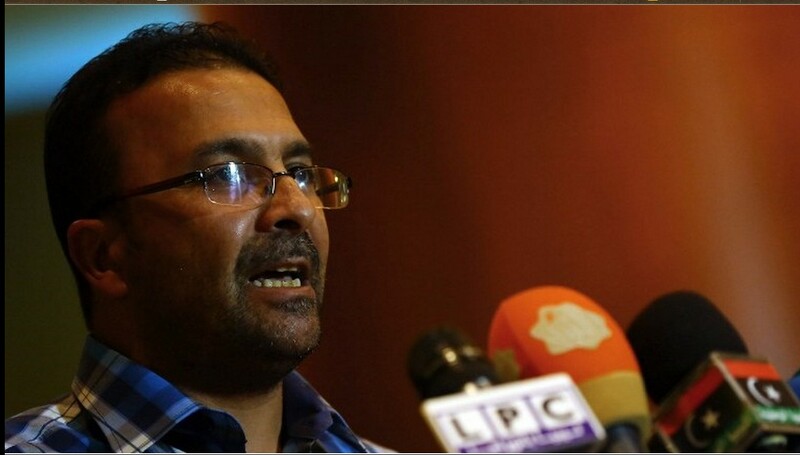 “The new parliament is recognized as having electoral legitimacy, but at the same time its decisions are ‘not recognized by a wide segment of the Libyan people’,” Mohammed Sawan, leader of the Muslim Brotherhood-linked ‘Construction and Development Party’, told dpa. The MB WAHABI-Islamist leader justified the recall of the General National Congress, saying the ‘new parliament ‘ (HOUSE OF REPRESENTATIVES) had not complied with constitutional requirements as to how it should take office or where it should meet. Violence in Libya escalated in May when General Khalifa Hftar and his loyalist militias launched a military campaign against various hardline MB WAHABI-Islamist militias in Benghazi. Among his prime targets was Ansar al-Sharia. Army commanders and local tribes have backed Major-General Hftar’s drive since May. His MB WAHABI–critics have accused him of seeking power, a charge he has repeatedly denied. being overrun by the MB WAHABI-Islamists. The House of Representatives has been meeting in the smaller eastern city of Tobruk, which has remained stable. une photo de ‎شبح الزنتان-صفحة رسميه‎. after a disagreement over a site that was held by the Libyan army and some other “booty”. MB Central Libyan “Shield” .. Comb Saadawi battalion headquarters in the eye of the Ministry. Note that the battalion participated with MISURATA Saadawi and Akkla Gneoh (alias al-Mahdi Abdul al-Haratne) in front Neighborhood Huts/ Cottages. The man nicknamed “Abu Obeida angular» faces charges including belonging to a terrorist group and Al-Qaeda“, noting that it was one of the leaders of Al Qaeda in Libya, and there is suspicion also in contact with the ‘Muslim’ Brotherhood in Egypt, the Egyptian Government has classified the group as a “terrorist organization”. “we condemn terrorism in any place». Egyptian authoriies said that the Flash drive is the so-called «rebel» room, noting that the Government is of the bear, and the incident reflects the lack of Libya to the State, saying that the militias are ruling Libya now. And «gift», background he was in Yemen and Sudan and known as Islamic Fighting Group. Egyptian security sources said that the authorities arrested «gift», nicknamed “Abu Obeida angular», on the North-West Coast in Egypt, after monitoring of secret meetings between him and members of the brotherhood in Egypt to arrange for terrorist operations in Egypt during the celebrations of the third anniversary of January 25. Egyptian authorities arrested «gift» specially prepared an ambush in an area between the provinces of Matrouh and Alexandria. The sources added that «angular» is one of the leaders of the Libyan Islamic fighting group founded early 1990s in Afghanistan before heading to work on Libyan territory against the rule of the late Colonel moamer kadhafi. The “angular” seen some in Libya as the right-hand man of Abu Anas liby» one large temples to organize. 91. Abdul Bari Sassi Tbush 92. Abdulmutallab key Eagle 93. Hesham Mohamed Larbi Albraihani 94. Abdulhakim on Ghwell 95. Walid Salem Ghwell 96. Fathi Taher Nasrat 97. F Shabani. Titled Aldanby 100. Mahdi Taher Abdel Fattah Chaouch 101 Ajili Da’ak 102. Mohamed Fathy and 103 to 104 Pshinh Hatem Mohammed Bashir Abuaoppe 105. Imad al-Bashir Abuaoppe -106 Imad Sassi spouses 107.-Bashir Qadri Hrath 108. Hisham Hussein Sheikh Hani 109. Fathi doubt 110. Fadi Ammar Greyhound 111. Atman Miloud hip 112. Mohammed Abdul Karim to restrain 113.-Taher Khalifa Almqoz 114. Abdulrahman Omar Jamal Mukhtar Almqoz 115. doubt 116. Abdul Khaliq Mukhtar doubt 117. Abdul Karim Mohammed Hassan Mohammed Hassan Ibrahim 118. 119 – Almoktov 121.-Mukhtar Hassan Hamza al-Mukhtar Hassan Hussein Taher Alsoiei 122.-123 Abdul Wahid Faraj gift 124. Shaaban Masoud Khalifa gift 125. Mustaa Shaibani Zockari 126. on behalf of Sheikh Hussein. 1- محمد حسين الخضراوي 2- علي محمد ابوزريبه 3- سمير الهادي كشلاف 4- وليد الهادي كشلاف 5- علي محمد بن رجب صاحب مصنع غاز واكسجين 6- سامي العربي النسر مساعد ابوعبيده 7- محمد كشلاف 8- صلاح العربي دراء 9- محمد المختار درا 10- محمد الكوني الخضراوي 11- الشيبانى الطاهر امحمد الشيبانى 12- الكيلانى ادريس الكيلانى 13- عمر ابوالقاسم القفر 14- محمود على السورى الحطاب 15- عامر على السورى الحطاب 16- سالم الطيب حسين الحطاب 17- منصور محمد الشيبانى الملقب بالقدس 18- جمعه محمد الشيبانى الملقب بالقدس 19- وسام محمد الشيبانى الملقب بالقدس 20- محمود عبد السلام قلعوز 21- عبدالرحيم الهادى الغول 22- محمد ابراهيم الحطاب 23- عمر الصغير المجدوب 24- حمزه الصغير المجدوب 25- حامد على عمر عبداللطيف 26- على على الطاهر البوعيشي 27- رمزى الهادى الشاوش 28- عادل رمضان الجرمى 29- مجدى رمضان عبدالعزيز الشاوش 30- خالد على العربى الفرد 31- عبدالحكيم على السورى الحطاب 32- الهادى ابراهبم الحطاب 33- اكرم حسين المشاط 34- عبدالله الطاخر الشيبانى 35- احمد ميلاد السورى 36- ناصر الطيب حسين الحطاب 37- على الكونى الحطاب 38- عبد الكريم بنور الحطاب 39- صلاح محمدابوزريبه 40- محمد الصغير الهنقارى 41- مروان عبدالله المشاط 42- سامى ابوالقاسم القفر 43- عبدالباقى حسين الجرمى 44- محمد صالح الشريف 45- عماد عامر الشين 46- رضوان على الفرد 47- باسط حسين ابوبكر 48- شكرى البشير النعاس 49- رمضان خليفه الحطاب 50- سامى على الحطاب 51- جمال خليفه عبدالله 52- عبدالسلام خليفه عبدالله 53- حمزة السنى الطاهر بن حسين 54- عبدالغنى حسين الطاهر 55- محمد عبدالسلام المقطوف قلعوز 56- على عمر عبداللطيف 57- بدر الدين شعبان الشيبانى 58- حيين ابراهيم الجرمى 59- فتحى الكونى الحطاب 60- الازهر الصادق محمد 61- عبدالمنعم على البعيشى 62- الطاهر محمدالقاضى 63- احمد عامر خماج 64- طارق ابوعجيله الهنقارى 65- محمد خليفه العمورى 66- مصعب ابوالقاسم درا 67- معاد ابوالقاسم درا 68- عبد الكريم الهادي الشاوش 69- عبد الباسط الهادي الشاوش 70- احمد العربي البريشني 71- سراج سالم النعاس 72- فاضل عبدالروؤف الزروق 73- محمد عبد الروؤف اازروق 74- مروان الهادي الزروق 75- نافع عبد الغني درا 76- محفوظ صالح محفوظ 77- امحمد عمران صابر 78- توفيق على السعدي 79- احمد محمد الفتوري 80- نوري عمر بركه 81- اسامه المختار النسر 82- رشيد المختار النسر 83- عبدالقادر مسعود الناجح 84- شكري عثمان مقيدش 85- عبد الحكيم عثمان امقيدش 86- فهمي سالم النسر 87- محمد محمود رمضان درا 88- اكرم الطاهر دراء 89- عبد الغني ساسي طبوشه 90- محمد مصطفي عبد الجواد 91- عبد الباري ساسي طبوسه 92- عبد المطلب مفتاح النسر 93- هشام محمد العربي البريشني 94- عبدالحكيم على الغويل 95- وليد سالم الغويل 96- الطاهر فتحى نصرات 97- جمعة الشبانى. ملقب الدانبى 100- المهدى على الطاهر الشاوش 101- عبدالفتاح العجيلى الدعيك 102- محمد فتحى والى 103- حاتم بشينه 104- محمد البشير ابوعوبه 105- عماد البشير ابوعوبه 106- عماد ساسي قرينات 107- قدري البشير شراطه 108- هشام حسين الشيخ 109- هاني فتحي الشك 110- فادي عمار السلوقي 111- عتمان ميلود الهب 112- محمد عبدالكريم ﻻبح 113- الطاهر خليفه المقوز 114- عبدالرحمن عمر المقوز 115- جمال المختار الشك 116- عبد الخالق المختار الشك 117- عبد الكريم محمد حسن 118- ابراهيم محمد حسن 119- المقطوف المختار حسن 121- حمزة المختار حسن 122- حسين الطاهر الصويعي 123- عبد الواحد فرج هديه 124- شعبان مسعود خليفة هدية 125- مصطعي الشيباني الزوكاري 126- باسم حسين الشيخ . And deluded dreamers and including can not ..
and Rishvana Mujahid dawn today from 4 axes ..
Let’s tell them you will not find in us a coward ..
And Snalmkm meaning of manhood O Tdonha ..
Sivhlon from the horror of what they will see ..
And Allah is the greatest over Kidd aggressor ..
under rocket locusts blind Ikcefha militias terrorist Abu Ubaida and his followers from them to the Brotherhood ..
Steadfastness and not to kill them .. our attack them Mduchhm ..
within the areas of the capital Tripoli again. Full denial of rumors broadcast by the appointed site for news about Libya asking for reconciliation with the International Community and recognizing the Brotherhood’s re-appearance in the GNC CONGRESS ! It was a good omen for us not to do so, because of our history of their torture upon our domestic sovereign home; and how they abused our bodies. Therefore, please do not moieties such lies, and do not take them into account. Some tails Misurata regions (Gado – Kklh – Gharyan – Kapaau – Zuwarah) they are pillaging, burning and looting of homes and properties of Zintan and Al-Rajaban and Rishvana. That most of them are residents of the mountain and passing through Rishvana (Yala misery luck), just Tnfkm that city by unjust people. Date # Misurata two pages .. cached page where the country .. and the Italians have a page allegiance to Qatar ..
# Book Misurata Aain Mashvt ZEW book .. # virility where two lines and all the rest Khiab ..
#تاريخ مصراته صفحتين .. صفحة باعو فيها البلاد للطليان .. وصفحة بيعتهم لها لقطر ..#كتاب مصراته ياعين ماشفت زيو كتاب .. #الرجوله فيه سطرين والباقي كله خياب ..
Coming from there and said that the schedule next Monday. Dr. Saleh and Rafla Mayouf. Representing (10) persons from each region. # Picture of one explosion gas lines, a subsidiary of Sirte Balbrivh ..
blast occurred near the area of ​​South Brega Achilles due to an increase in pressure on the tube ..
Mzrath actions of Jews in SIRTE, same being done by them now. for technical reasons and the driver survived. la vidéo de ‎قناة الجماهيرية العظمى‎. There is a great struggle and a big difference between (Aoroba.asaudih .alamarat) ..
Misrata militias and a group of Gypsies Ibia.fa Mnfd Ras Igdir Arkpo system, are in the wanted lists of the ICC, along with Kabdan Ali’s 3 people. Rickety aircraft overflights scapegoat for the homeland! of the House of Representatives majority. Ali al-Dabaiba is the former “head of projects and the development of cities and facilities” under the GNC Allaotunai Conference, until his person being named and linked to the financing of Islamic groups and armed militias inside, and by the Interpol reports said earlier. Police emirate of Dubai and at the request of Interpol, the international stop billionaire named Ali_adbebh_al-Musrati required Interpol on charges of theft and embezzlement and looting of public money and put under house arrest at his palace in the luxurious area of the coast of Jumeirah in Dubai, The al-Dbebh is the former head of the projects and the development of cities and utilities in under the puppet GNC regime, until his name was called and the machine has to do with the financing of Islamist groups and armed militias internal and according to what reports said Interpol earlier. News about the arrest of Libyans in the UAE to support the process, “the dawn of Libya”. There were reports of a campaign of arrests launched by their security services. Allah is the greatest ! RIYADH, Saudi Arabia (AP) — A meeting of Gulf foreign ministers ended on Saturday without a clear way out of a monthslong diplomatic spat with Qatar, although some envoys signaled that progress had been made. Saudi Arabia, along with the United Arab Emirates and Bahrain, withdrew their ambassadors from Qatar in March in an unprecedented public protest largely believed to be spurred by the tiny nation’s support for WAHABI-Islamist groups in Egypt, Libya, the Gaza Strip and elsewhere. They accused Qatar of interfering in their domestic affairs and failing to uphold a security pact drawn up last year. The UAE and Saudi Arabia have little tolerance for ‘Muslim’ Brotherhood-linked activity and perceive the WAHABI-Islamist group as a threat to their political systems. Despite weeks of secretive talks, the statement by the ministers on Saturday made no mention of a resolution with Qatar. Instead, the group’s lengthy statement addressed a wide range of regional issues, starting with the six-nation Gulf Cooperation Council’s condemnation of terrorism and support for international efforts to combat the financing of the Islamic State group in Iraq and Syria. The GCC statement also said ministers discussed relations with Iran, the Israel-Hamas cease-fire in Gaza, protests in Yemen and the fighting in Libya — issues where there are sharp policy differences among the Gulf countries. Do you know why he left?! Because the Gulf Cooperation Council will issue a statement that acknowledges Bamcil House of Representatives is the sole legitimate representative of the Libyan people. It will go back to the countries of the Gulf Cooperation Council expelled from Qatar and lock the land borders and airspace for air and sever relations if it continues in Altand. This entry was posted in Actualités et politique, History, Mankind, Music Videos, Non classé and tagged 'MUSLIM' BROTHERHOOD & her offsring, bani walid, Cyrenaica, dirty MISURATA, EGYPT, Green Nafusa Western Mountains, SAUDI ARABIA, SOUTH LIBYA, TRIPOLI, UAE. Bookmark the permalink.